What with all the Sinclairian revelations about modern agri-monopolies, beef of ill health jacked-up on antibiotics and hormones, and chemically bathed hamburger, I’m kinda getting scared of my food. I don’t care if it’s science or standard business practice today. I agree with Anthony Bourdain. 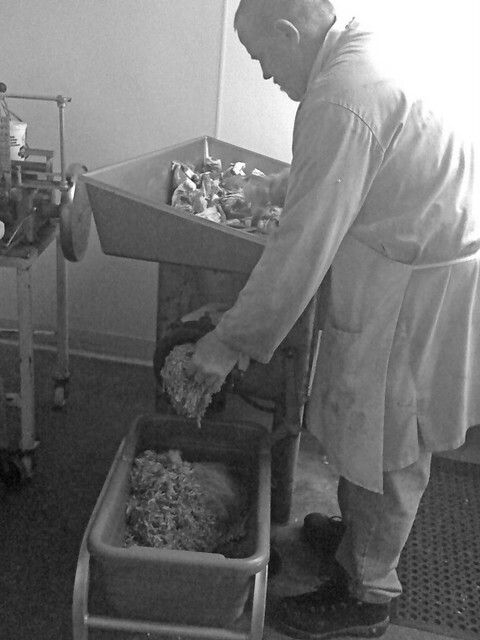 Hamburger should not have to be disinfected with ammonia! I refuse to join the bandwagon and treat eggs and pork like poison. I should not fear what I eat. I say go back to the not-so-old ways. If we eat meat, let’s get it from reputable sources. Let’s know where our beef comes from. When I was a kid in Oregon, my parents bought their beef from the local butcher. Who got it from local farmers. Who raised and pastured their cattle naturally. No hormones were needed. No antibiotics. It wasn’t a pretentious food trend back then. It was what was done. Sure, it was old-fashioned, but it was economical. We bought a side of beef and the butcher cut and packed it to our specs. And if you didn’t have a large freezer of your own, he even offered lockers for rent there, where you could store your beef. I remember our weekly shopping trips: making a stop at the drive-through dairy, then off to the locker to pick up some meat for the week. … and that’s all we know (or care to know). But it’s worth the effort. You can do it. But how? If you eat beef, find a reputable, local source. (And if not, find a reputable, local source for your veggies!) Make sure they do things right. Go to the fair and buy a cow from a 4-H family. Search your local farmers markets. Ask your local farm-to-table restaurant(s) where they get their beef. In my case, finding a local source was easy. A neighbor’s godfather Nate has a farm (the Happy Tummy Farm) in Alpine, California and raises cattle, goats, pigs and chickens. I’ve visited and checked it out. So Hanis and I split a side of beef from the farm: a pastured Black Angus, which was finished its last month on corn. 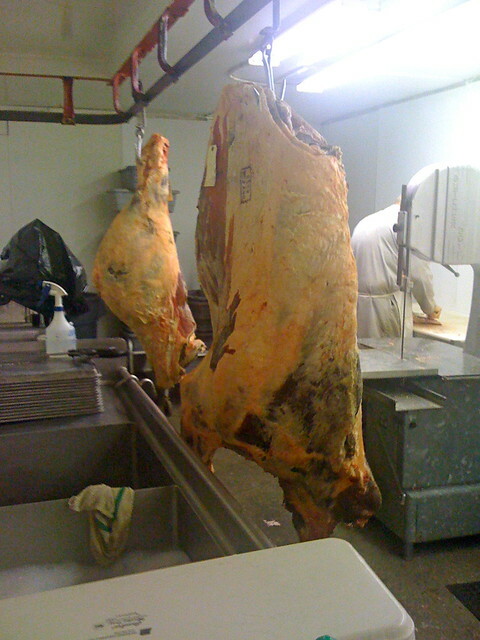 It was processed on the farm, then dry aged for about a month and butchered at Scott’s Custom Meats (240A East 4th Street, in Perris, California, just about an hour from where I live). 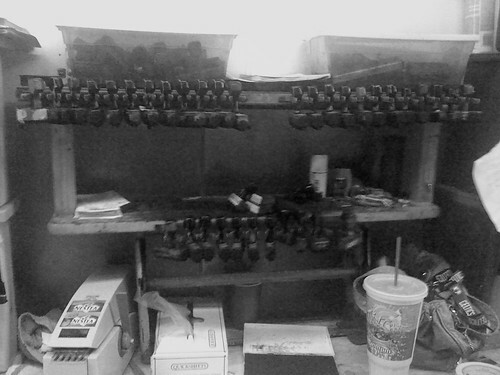 They’ve been in business for over thirty years. 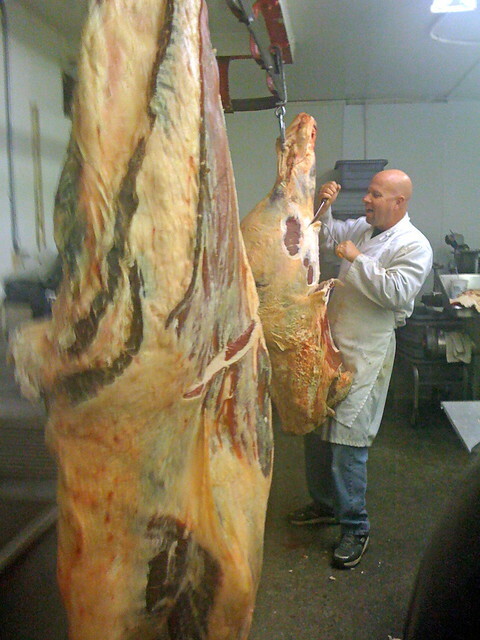 The butchers there are approachable, professional, and informative. They’ll cut the meat to your exact specs. 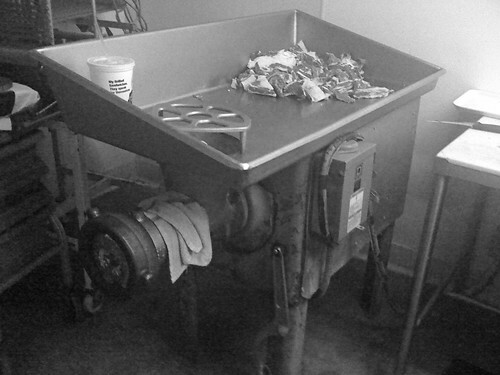 Hauling it out. 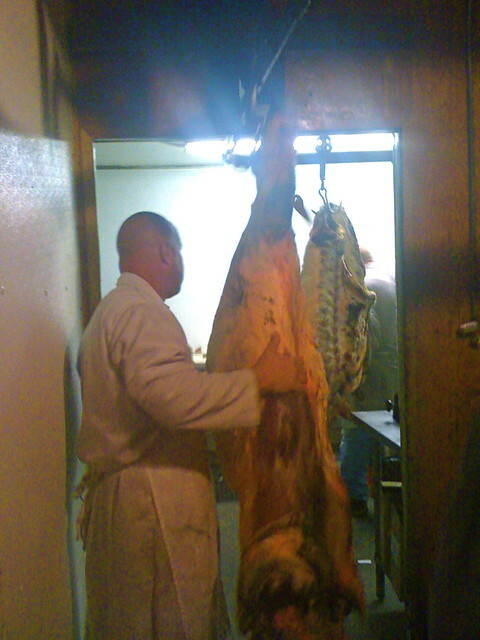 The beef was quartered and dry aged for nearly a month. We bought a half together. 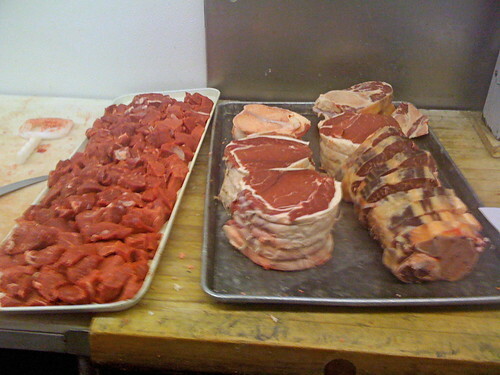 It took two butchers and a packer an hour and fifteen minutes to break down the beef and wrap the cuts for us. 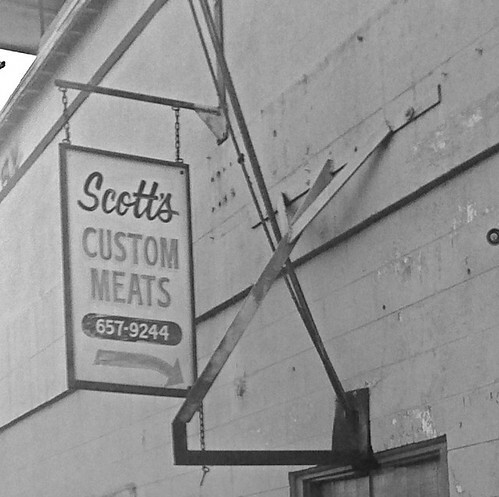 Dennie at Scott’s Custom Meats enlightened us on some questionable industry practices he’s heard about. Unscrupulous butchers may have retail counters where your best cuts will end up, to be sold at a high profit — to the butcher. They’ll do this knowing — or thinking — that their city folk customers are oblivious to what they’re buying. Unfortunately, in most cases, they’re right. 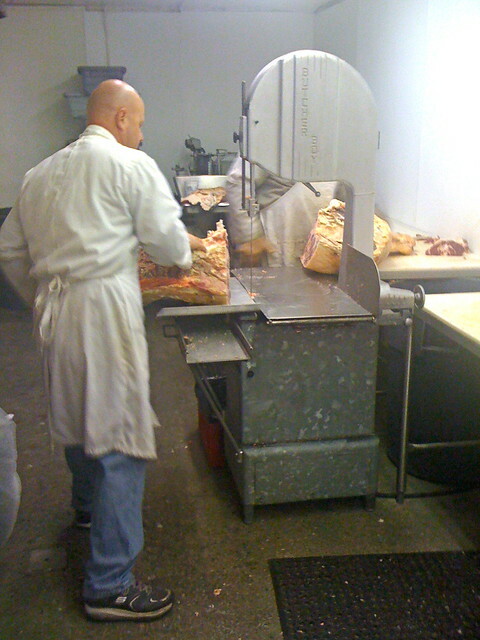 Cutting and trimming the steaks. Go to a custom butchershop, where retail sales don’t get introduced. Where they provide a service only. It’s their business, and they’ll be proud of the quality of service they provide. Some of the steaks, roasts, and bones for stock, too! 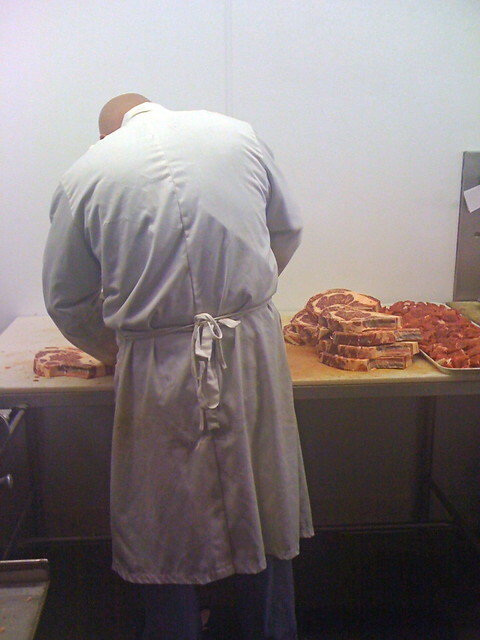 If you do get a butcher, make sure to get a cut sheet, or inventory, of the cuts you’re paying for. If they don’t provide you with one, or object to it — beware. Don’t trust ’em. Open up a package and check out the meat. If some looks fresh and some looks grey or dried out, chances are your butcher may have swapped out your fresh meat with some unsold cuts from his retail counter! After all was said and done, we ended up with about 400 pounds of beef. That’s a lotta packages! 2 Responses to Do you know where your beef comes from? Really like your approach of buying your own beef from the source (wish we had not a small apartment with no large freezer to do the same). One question is why was the beef corn-fed the last month ? Obviously the argument is always more marbling but since cows can’t digest corn with their rumen it’s major source for pain and often infection for them and one of the main reason for the high use of antibiotics. On a small farm, where the cattle can roam free and still graze, the corn is introduced slowly in its last happy month. No need for antibiotics!